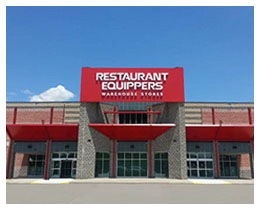 Restaurant Equippers strives to make your shopping experience as effective as possible whether purchasing in our Warehouse Stores, phoning our Nationwide Order Center, ordering at Equippers.com or returning an item. We will help make your return fast and simple. Phone 800-235-3325 to receive your RMA Number and obtain instructions for making your return from our Customer Service Specialist. Return the unused item(s) in its original packaging with all accessories, components and paperwork included, following all instructions provided by your Customer Service Specialist. Unless you have arranged with Customer Service to personally return the item(s) to one of our Warehouse Stores, ship to the address shown on your Return ID Ticket. Make certain you enter your RMA Number onto your Return ID Ticket (printed as a part of your original invoice) and include with the item being returned. More than 30 calendar days have transpired since purchase (Except when approved for return under Manufacturer Warranty). All original accessories and components are not included with return. The item has been damaged due to improperly moving, unpacking, installing or using the product (unless noted as damaged on the carrier’s copy of the delivery receipt at the time of delivery). You did not obtain an RMA from a Restaurant Equippers’ Customer Service Specialist, enter it onto the Return ID Ticket and include it with the returned merchandise. Unless your item arrived in error or was damaged, defective, shipped in error or approved for return under Manufacturer Warranty you will be charged for REI’s cost of shipping the returned item back to Restaurant Equippers. However, you can avoid the cost of the return freight by returning the product to any of our Warehouse Stores.